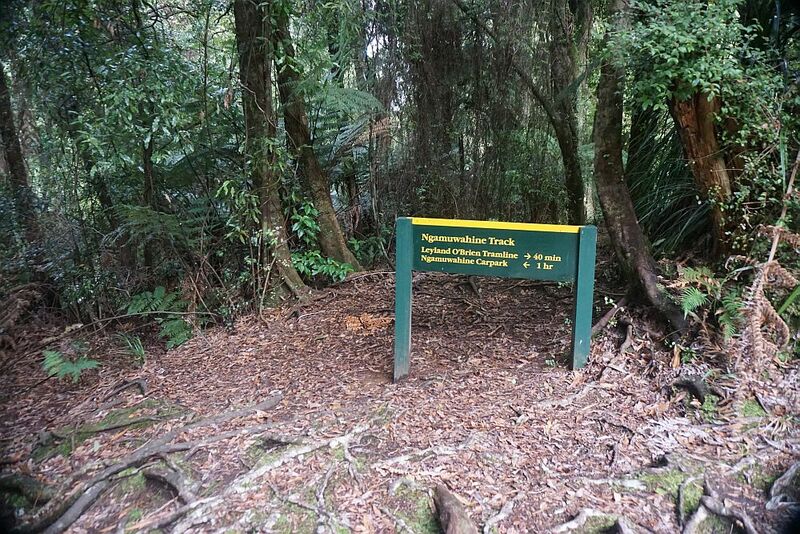 The Ngamuwahine and Ngamuwahine Loop Tracks on the northern slopes of the Kaimai Ranges in the Kaimai Mamaku Forest Park are accessible from the end of Ngamuwahine Road, off SH29, about 25km south of Tauranga. Ngamuwahine Road, about 3km long, is gravel, winding, and only about 1 vehicle width most of the way. So meeting with other traffic usually means one of them reverses to the nearest suitable passing spot. 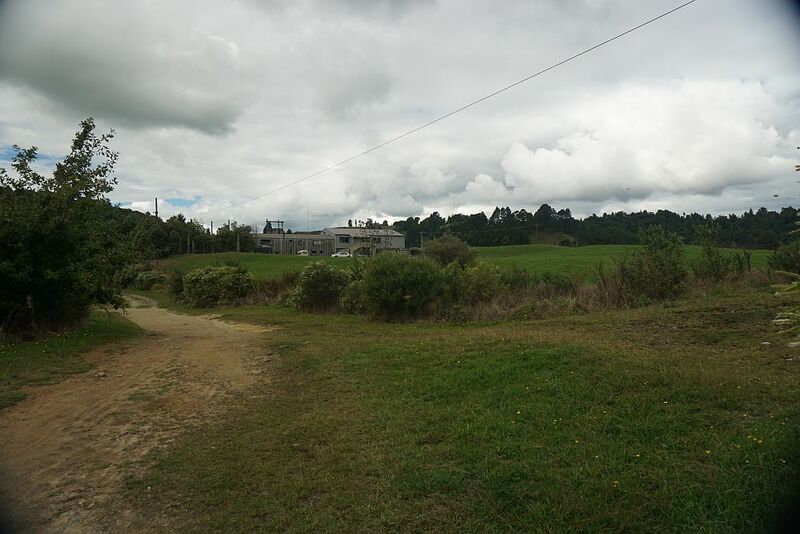 Tauranga Intermediate School administers an outdoor education facility, the Ngamuwahine Outdoor Education Lodge, at the end of Ngamuwahine Road. There is a large grass parking area and picnic area at the end of the road, by the entrance to the lodge and the start of the track. But there are no toilet facilities on or near the track. 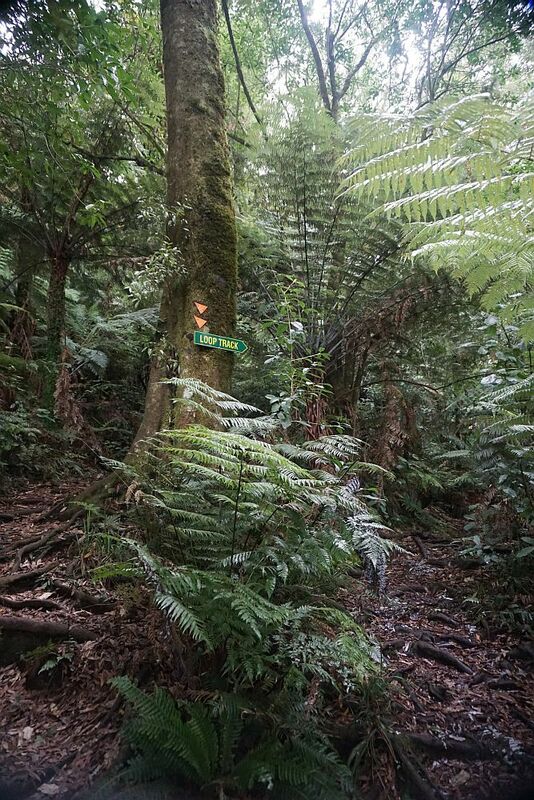 The tracks pass through regenerating native forest, with a number of pine trees in between. All the tracks are under tree cover, so will stay moist for most of the year. 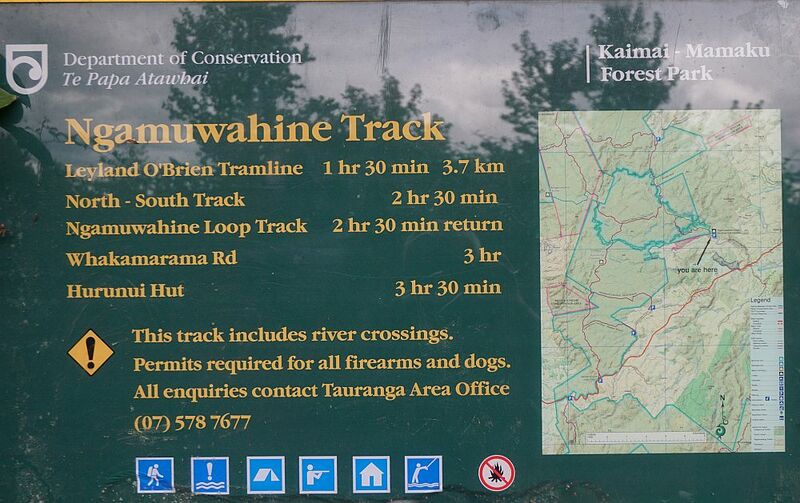 The DoC web site has a short description of the Ngamuwahine Track, but no mention of the Loop Track. And it is described as an easy walking track. 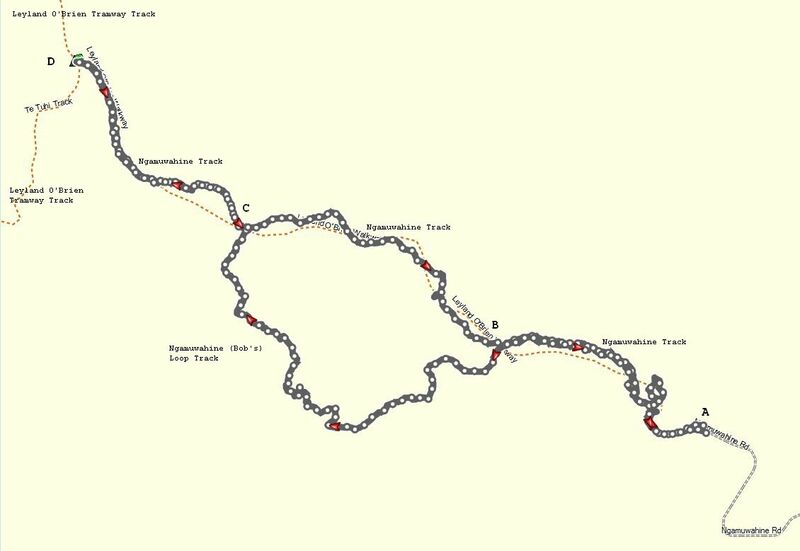 Since the river crossings are not bridged it could better be described as an easy tramping track, according to DoC’s own walking track categories. The tracks are quite steep in places, mostly on either side of the river crossings, and due to vegetation not always easy to follow. Most of the orange markers are well placed, though. 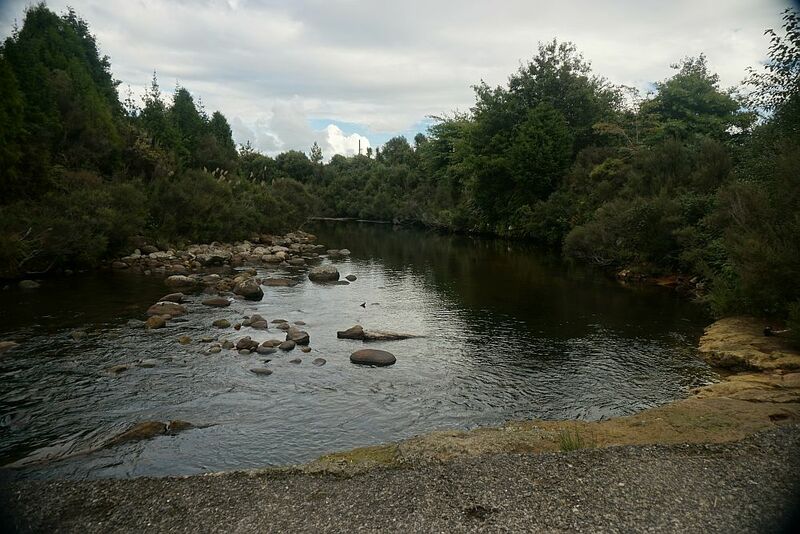 There is a river or stream crossing of a tributary to the Ngamuwahine River. These crossings could be difficult after heavy rainfall where the river levels would be considerably higher than shown on these photos. There are no great views of the Bay of Plenty anywhere along the tracks, but it was a pleasant walk on an overcast autumn afternoon, with birdsong and the sound of the rivers for accompaniment. 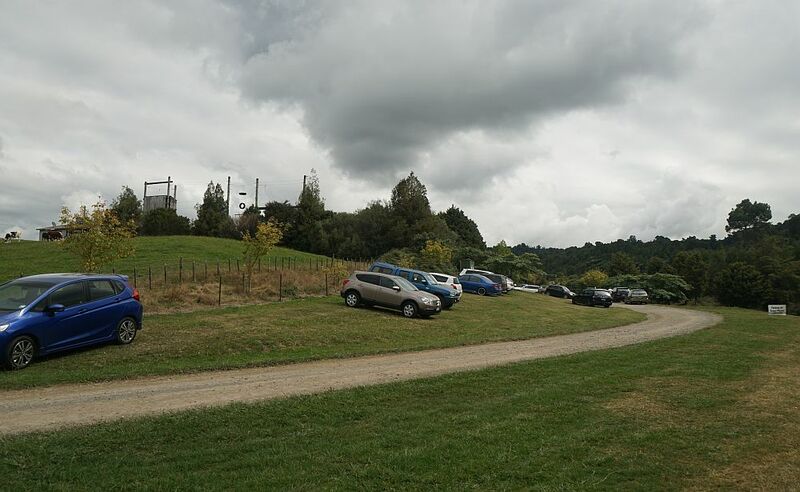 The grass parking area at the end of Ngamuwahine Road, with the picnic area to the right, and the Lodge to the left. 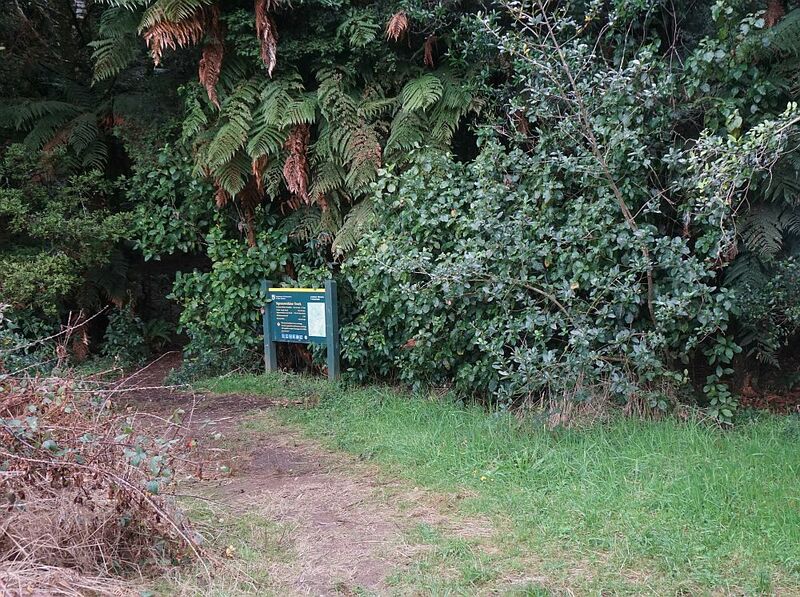 The entrance to the Ngamuwahine Track is through a gate at the far end of the parked vehicles, and a short distance down a continuation of the road. The Outdoor Education Lodge seen from the other side, with a flying fox alongside the road. 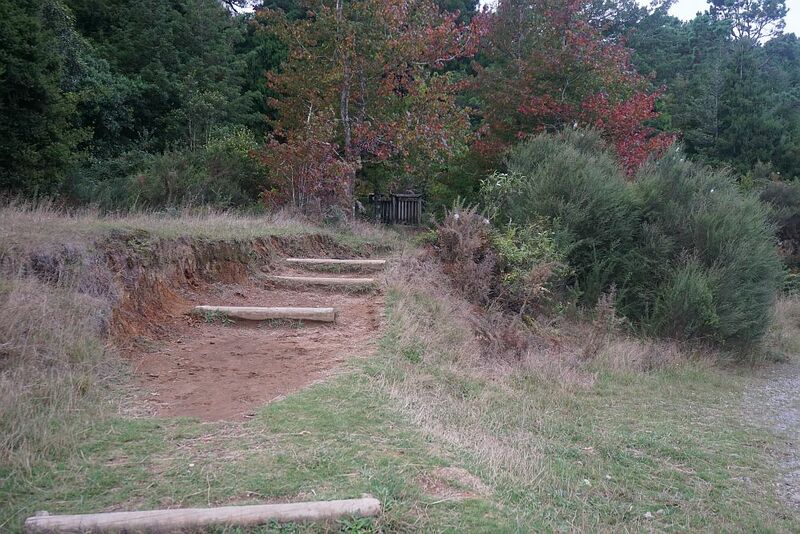 The entrance to the track is not very obvious from the continuation of the road. It’s up these few steps (the only ones on the tracks) and over the wooden bridge in the centre of the photo. There is a concrete bridge or ford across the Ngamuwahine River off to the right. The Ngamuwahine River seen from the bridge/ford near the start of Ngamuwahine Track. The start of the track, to the left of the sign. 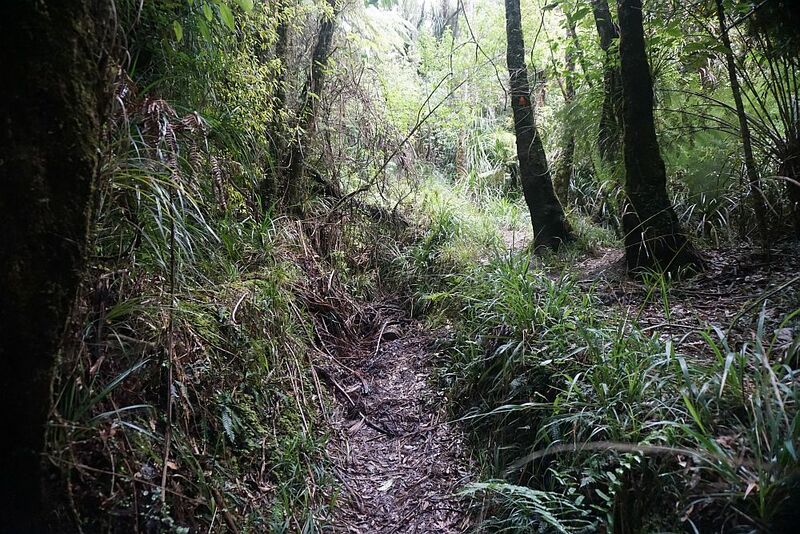 There is a short loop track down to the Ngamuwahine River and back to the starting point. This track is not marked, except for the starting point. The Ngamuwahine Track branches off to the left. Ngamuwahine Track continues on the right, with Ngamuwahine (Bob’s) Loop Track to the left. On this walk the Loop Track was followed in the uphill direction, with the direct track on the return. There are a few larger trees alongside the track. The area was milled about 100 years ago, so most of the larger trees would have been too young or otherwise unsuitable for milling at that time. 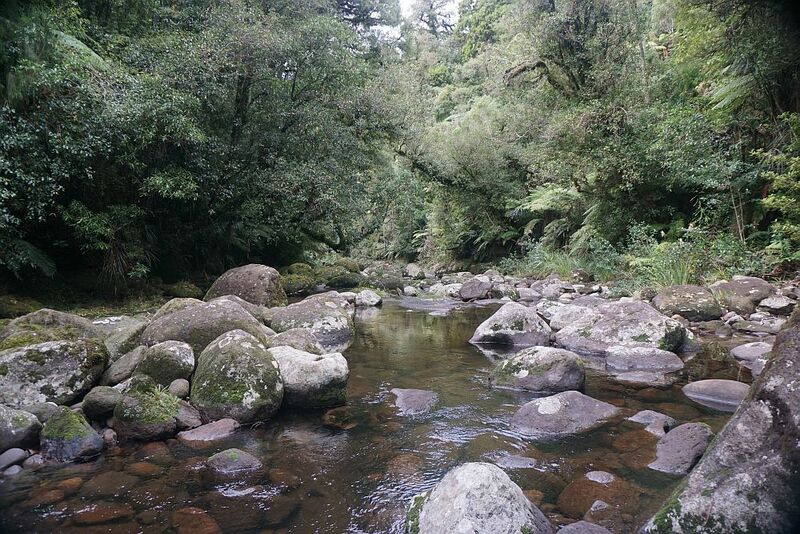 The river crossing on the Ngamuwahine Loop Track. It was possible to cross without getting wet feet. 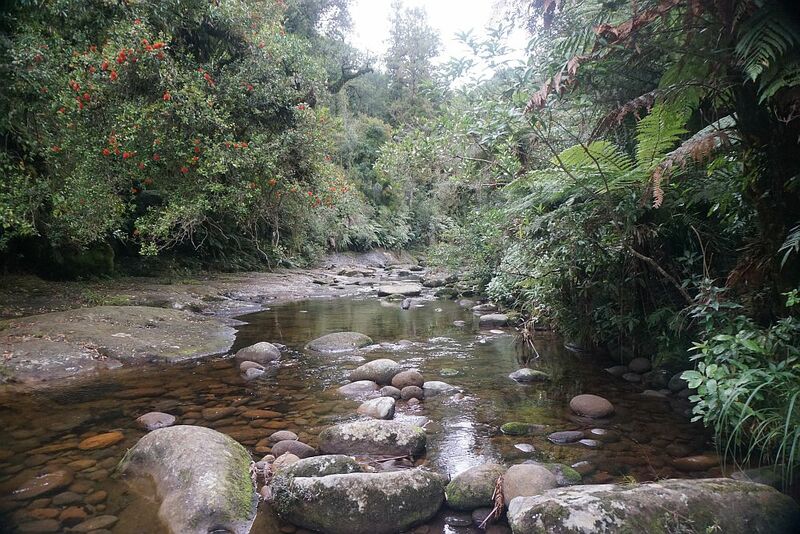 The entrance and exit tracks are some distance apart, so it’s necessary to follow the stream for about 100m to locate the exit, upstream when walking the loop track in the uphill direction. The southern junction of the Ngamuwahine Track and the Ngamuwahine Loop Track. Approacing the Leyland O’Brien Tramway Track, the Ngamuwahine Track partly follows a trench with looks like either an old water race or the remains of a trench worn by dragging logs along the ground. 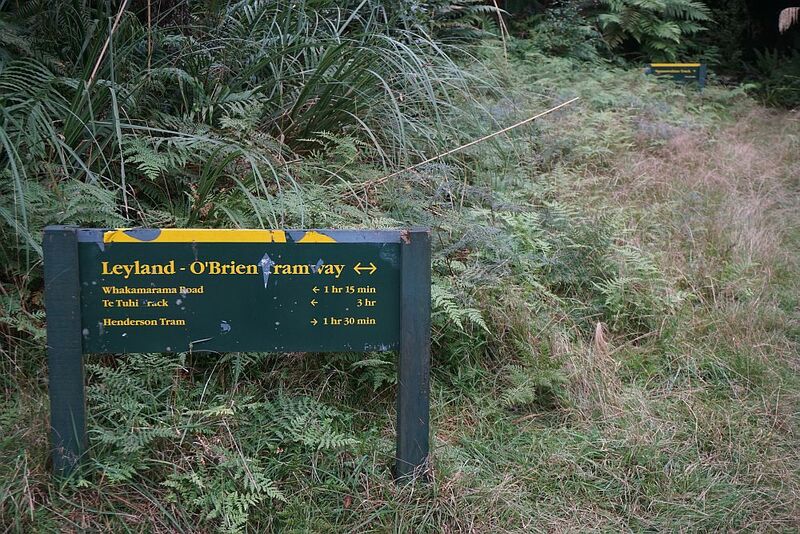 There is a small clearing at the junction of Ngamuwahine Track and Leyland O’Brien Tramway Track. 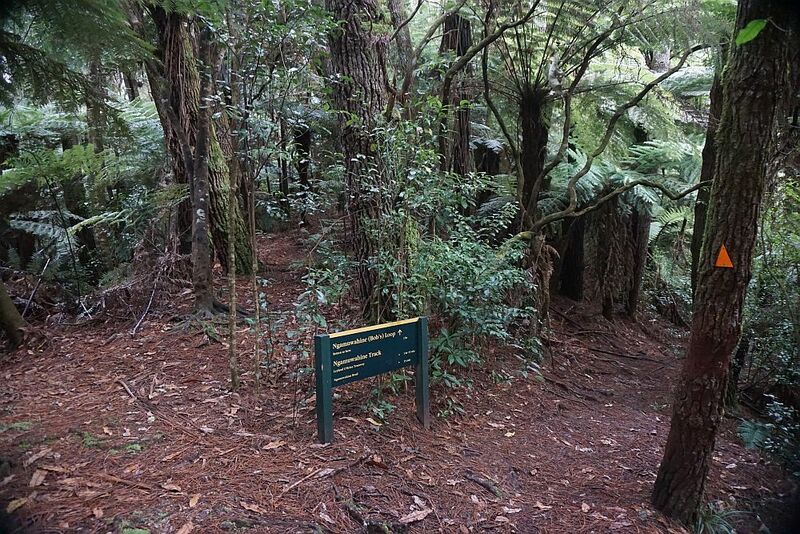 The sign for the Ngamuwahine Track can be seen in the background to the upper right. Stragenly there is no mention of it on the foreground sign. The river crossing on the Ngamuwahine Track. The track exit is directly across from the track entry point. 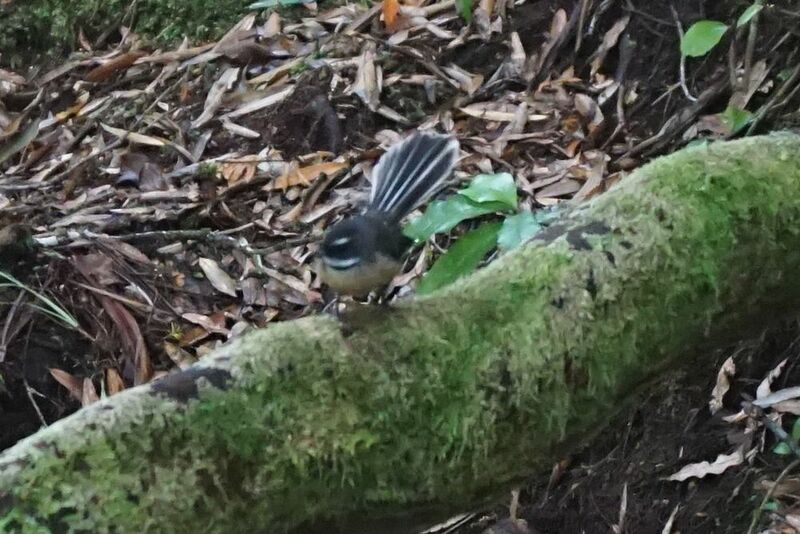 Fantails (piwakawaka) do not sit still for very long at a time, so they can be difficult to catch on camera. This one sat there for a few seconds, but without the tail fully fanned out. The track was walked on April 5, 2015. Total walking time was about 3 hours 20 minutes, with a total distance of about 9.5kms. The GPS log shows the tracks and the track names as shown on the DoC signs. 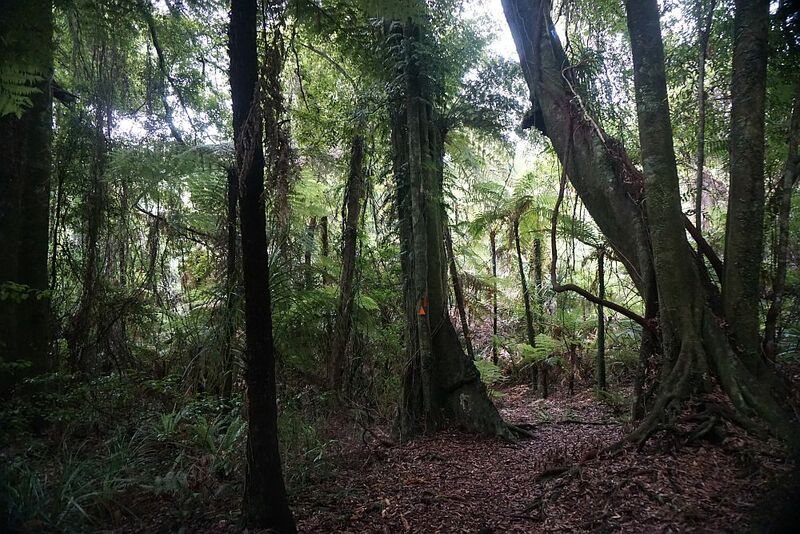 This entry was posted in Walks and tagged Kaimai Mamaku Forest Park, Kaimai Range, Ngamuwahine Loop Track, Ngamuwahine Track, Tauranga on 2015-04-06 by nzartig.